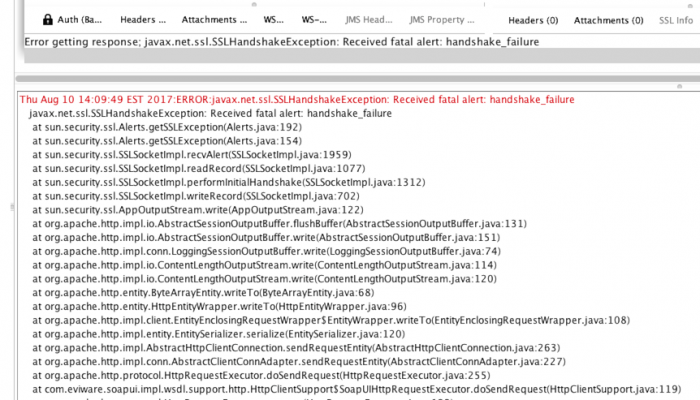 Back in 2014 I've written an article about addressing the SSLHandshakeException in SoapUI. Technology has moved on since then so that approach no longer works and shouldn't be used. If you're getting this exception being thrown when trying to call a web service hosted in WebLogic 12.2 (running on Java 8) use this approach instead. This is what SoapUI reports, it's the same error as back in 2014 essentially, however the root cause is quite different. Starting with JDK 8u31, the SSLv3 protocol (Secure Socket Layer) has been deactivated and is not available by default. Great, so SSLv3 is disabled. Not setting the weblogic.security.SSL.protocolVersion system property enables the SSLv3Hello, SSLv3, and TLSv1 protocols. In addition, for JSSE, all versions starting with "TLS" are also enabled. However since the JDK specifically disables SSLv3, the above options are not available. The solution is to use TLSv1.1 or better TLSv1.2 when connecting. This is done by adding the line below to the vmoptions.txt file in SoapUI (/Applications/SoapUI-5.3.0.app/Contents/vmoptions.txt). I've tried and confirmed that the TLSv1 setting also doesn't work (presumably since it is also affected by POODLE). However, TLSv1.1 does work, as does the TLSv1.2.